last weekend the urge to bake a little no knead bread seized me although i didn't have any flour on hand suitable for bread baking . as it takes far less time to produce this bread than a trip to the local supermarket, i decided to experiment by using FOUR YEAR OLD unbleached all-purpose. interestingly and predictably, the flavor was good and the texture much less lacy than usual. no complaints from my husband who can be quoted as saying: "maybe the holes are important to you but they aren't to me--in fact i find them undesirable"! this weekend we had to do our bi-monthly shopping so i picked up a bag of harvest king--turned it around to check that my recipe was still on the back--and as usual had to fight the impulse to hug it. whipped up the bread in under 5 minutes (added a few droplets of water to the moisten the flour at the bottom that hadn't gotten incorporated) and left it to sit undisturbed for 18 hours. then scraped it onto a floured counter and with lightly floured hands gave it the 2 business letter folds, set it on a small silpat sheet and covered it with a big glass bowl. after 1 hour preheated the oven to 450˚F/230˚C along with the baking stone and baby cast iron lodge pot and lid. 2 1/2 hours later, when pressing it gently with a wet finger tip and it kept the impression for a brief moment i decided to test something else: without flouring the top i lifted the bread still on the silpat, held it close to the pot, and then inverted it. 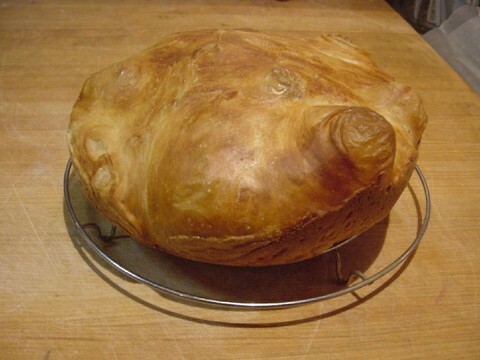 gradually it detached itself from the silpat and slipped right into the pot--slightly unevenly. i jiggled it a little which didn't help much, covered it and set it on the baking stone. 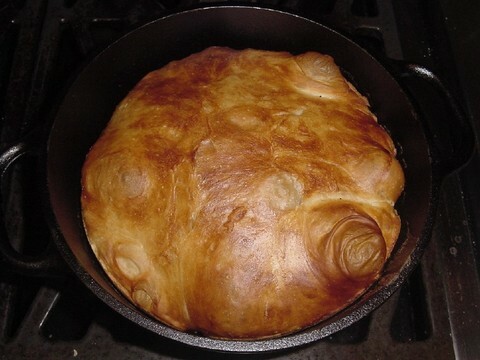 after 20 minutes i removed the lid and saw that the bread had risen beautifully and had some huge bubbles on the top. i lowered the heat to 400F/200C., turned the oven to convection to vent out any moisture, and baked for another 10 minutes. the bread unmolded easily. it tested 207F/97C. and the bottom was a tiny bit too brown to my taste--next time i'll try 425F/218C for the first 20 min. or maybe just bake 7 minutes with the lid off at the end. the bread resembled an etruscan drinking utensil. 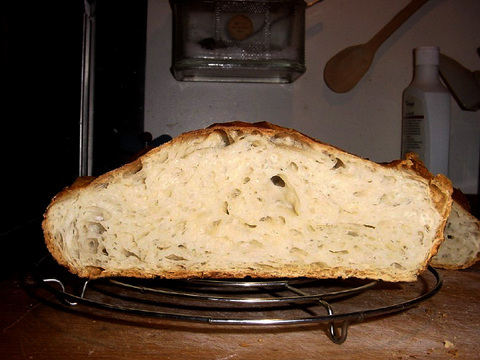 it had its usual lacey open texture and extra vibrant flavor due to the fresh flour. incidentally, people have complained that this technique renders the crumb too moist. i don't mind this and in fact the next day, i toast it lightly and it's still moist but much less so. if you prefer it drier the same day you have only to return it to the oven with the door open for another 10 minutes and it will help to vent internal moisture. IDEA: as summer approaches and the heat rises, the thought of turning the oven to 450F/230C for 2 hours may justifiably leave you cold. if you have a gas grill, simply use that to preheat the pot and bake the bread. it should work perfectly. i intend to try it when my 93 year old father comes to visit. he'll just love seeing me drop the dough into the burning hot cast iron pot not to mention the simplicity of preparing the dough. by the way, a charcoal grill would work too if you use enough charcoal to get hot enough but it's more of a nuisance because more briquettes would need to be added to maintain the heat for so long a period of time. NOTE: the recipe has already been posted in the larger size and baby size on this blog.